In general, a child is considered to have a speech delay if the child's speech is significantly below the norm for children of the same age. A child with speech delay has speech development that is typical of normally developing child of a younger chronologic age, the delayed child's skills are acquired in a normal sequence, but at a rate slower than normal. Children, 5 years of age or younger whose speech and language delays are untreated may exhibit diminished reading skills, poor verbal and spelling skills, behavior problems, and impaired psychosocial adjustment. This can lead to the overall academic underachievement and a lower IQ that may persist into young adulthood. Thus, screening and identification of a speech delay can lead to early intervention and therapy. In this review article, we will discuss the etiology of speech delay in children, screening tests, management, and the role of the pediatric dentist in the diagnosis and referral for further intervention and treatment. Language processing: in which the content of an utterance is converted into phonemic symbols in the brain language centre. Generation of motor commands to the vocal organs in the brain motor centre. Articulatory movement for production of speech by the vocal organs based on these motor commands. Emission of air sent from the lungs in the form of speech. Speech delay may be a manifestation of numerous disorders. Intact hearing in the first few years of life is vital to language and speech development. Hearing loss at an early stage of development may lead to profound speech delay. Hearing loss may be conductive or sensorineural conductive loss is commonly caused by otits media with effusion, malformations of the middle ear structures and atresia of the external auditory canal. , Sensorineural hearing loss may result from intrauterine infection, Kernicterus, ototoxic drugs, bacterial meningitis, hypoxia, intracranial hemorrhage, certain syndromes (e.g., Pendred syndrome, Waardenburg syndrome, Usher syndrome and chromosomal abnormalities (e.g., trisomy syndromes). Maturation delay (developmental language delay) accounts for a considerable percentage of late talkers. In this condition, a delay occurs in the maturation of the central neurologic process required to produce speech. The condition is more common in boys, and a family history of "late bloomers" is often present. The prognosis for these children is extremely good and they usually have normal speech development by the age of school entry. Autism is a neurologically based developmental disorder, onset before the age of 36 months. Autism is characterized by delayed and deviant language development, failure to develop the ability to relate to others and ritualistic and compulsive behaviors, including the stereotyped repetitive motor activity. A variety of speech disorders have also been described, such as echolalia and pronoun reversal. The speech of some autistic children has an atonic, wooden, or a sing song quality. Autistic children in general, fail to make eye contact, smile socially, and respond to being hugged or use gestures to communicate. Elective mutism is a condition in which children do not speak because they do not want to. Typically, children with elective mutism will speak when they are on their own, with friends and sometimes with their parents, but they do not speak in school, public situations or with strangers. It is seen more commonly in girls than in boys. The basis of mutism is usually family psychopathology. The children are negativistic, shy, timid, and withdrawn. The disorder can persist for months or years. A deficit in the comprehension of spoken language is the primary problem of receptive aphasia. The speech of these children is not only delayed but also sparse, agrammatic, and indistinct in articulation. Most children with receptive aphasia develop a speech of their own, understood only by those who are familiar with them. Assessing children for speech and language delay and disorders can involve a number of approaches, although there are no uniformly accepted screening tests for use in primary care setting. Mile stones for speech and language development are generally acknowledged. Concerns for delay arises if there is no verbalization by the age of 1 year, if speech is not clear or if speech or language is different from children of the same age. Parent questionnaires and parent concern are often used to detect delay. Most formal instruments designed for diagnostic purpose have not been widely evaluated for screening. Instruments constructed to assess multiple developmental components, such as the ages and stages questionnaire,  clinical adaptive test /clinical linguistic and auditory milestone scale,  Denver developmental screening test,  includes speech and language components. Instruments designed for specific communication domains include the McArthur communicative development inventory,  ward infant language screening test, assessment, acceleration, and remediation (WILSTAAR),  fluhaarty speech and language Screening Test,  early language milestone scale several others. The test consists of 43 items arranged in three divisions, auditory expression, auditory receptive and visual. It relies primarily on the patient's report, with occasional testing of the child. It can be done in the physician's office and it takes only 1-10 min to administer, depending on the age of the child and scoring technique. Score with either pass or fail or point scoring method. Pass/fail yields a rating for the tests as a whole. For children 2.5 years to 18 years of age the peabody picture vocabulary test revised  is a useful screening instrument for word comprehension. It is an untimed, individual intelligence test. The test measures an individual's receptive (hearing) vocabulary for standard American English and provides a quick estimate of their verbal ability or scholastic aptitude. It was created by two pioneers in special education, Lloyd M.Dunn and Leoata M. Dunn. The test is given verbally and takes about 20-30 min. For its administration, the examiner presents a series of pictures to each person. There are four pictures to a page, and each is numbered. The examiner states a word describing one of the pictures and asks the individuals to point to or say the number of the picture that the word describes. Pediatric dentists are primarily involved in treating young children and communication with the child is essential for co-operation and effective treatment. During the process of communicating with the child, any evidence of abnormal speech or deviant or delayed language skills can be identified by the pediatric dentist. Thus, screening children for speech and language delay can be integrated into routine clinical practice, followed by referrals for thorough diagnostic evaluation and appropriate intervention. 1. American Speech -Language Hearing Association. Welcome to ASHA. Accessed online. http://www.asha.org. 2. Blum NJ, Baron MA. Speech and language disorders. In: Schwartz MW, editor. Pediatric Primary care; a problem oriented approach. St. Louis: Mosby; 1997. p. 845-9. 3. Ansel BM, Landa RM, Stark-Selz RE. Development and disorders of speech and language. In: Oski FA, DeAngelis CD, editors. Principles and Practice of Pediatrics. Philadelphia: Lippincot; 1994. p. 686-700. 4. Nelson HD, Nygren P, Walker M, Panoscha R. Screening for speech and language delay in preschool children. Evidence synthesis no 41. Rockville MD: Agency for healthcare research and quality. Accessed online at: http://www. ahrq.gov/downloads/pub/prevent/pdfser/speechsyn.pdf. 5. Honda M, NTT. CS laboratories. Speech Synthesis technique based on speech production mechanism. Journal of Acoustical Society of Japan 1999;55:777-82 . 6. Schwartz ER. Speech and language disorders. In: Schwartz MW, editor. Pediatric primary care: Problem oriented approach. St. Louis: Mosby; 1990. p. 696-700. 7. Shonkoff JP. Language delay: Late talking to communication disorder. In: Rudolph AM, Hoffman JI, Rudolph CD, editors. Rudolph's pediatrics. London: Prentice-Hall; 1996. p. 124-8. 8. Silva PA, Williams S, McGee R. A longitudinal study of children with developmental language delay at age three: Later intelligence, reading and behavior problems. Dev Med Child Neurol 1987;29:630-40. 9. Stevenson J, Richman N. The prevalence of language delay in a population of three -year-old children and its association with general retardation. Dev Med Child Neurol 1987;29:630-40. 10. Vessey JA. The child with cognitive, sensory, or communication impairment. In: Wong DL, Wilson D, editors. Whaley & Wong's nursing care of infants and children . St. Louis: Mosby; 1995. p. 1006-47. 11. Coplan J. 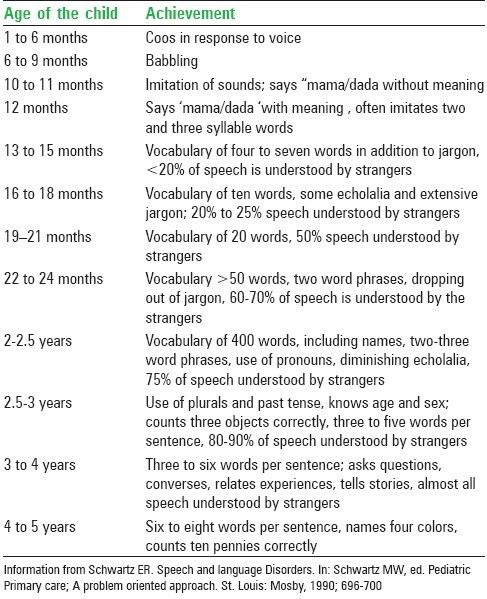 Evaluation of the child with delayed speech or language. Pediatr Ann 1985;14:203-8. 12. Leung AK, Robson WL, Fagan J, Chopra S, Lim SH. Mental retardation. J R Soc Health 1995;115:31-9. 13. Leung AK, Robson WL. Otitis media in infants and children. Drug Protocol 1990;5:29-35 . 14. Schlieper A, Kisilevsky H, Mattingly S, Yorke L. Mild conductive hearing loss and language development: A one year follow - up study. J Dev Behav Pediatr 1985;6:65-8. 15. Allen DV, Robinson DO. Middle ear status and language development in preschool children. ASHA 1984;26:33-7. 16. Whitman RL, Schwartz ER. The pediatrician's approach to the preschool child with language delay. Clin Pediatr (Phila) 1985;24:26-31. 17. McRae KM, Vickar E. Simple developmental speech delay: A follow -up study. Dev Med Child Neurol 1991;33:868-74. 18. Davis H, Stroud A, Green L. The maternal language envoirment of children with language delay. Br J Disord Commun 1988;23:253-66. 19. Allen R, Wasserman GA. Origins of language delay in abused infants. Child Abuse Negl 1985;9:335-40. 20. Bishop DV. Developmental disorders of speech and language In: Rutter M, Taylor E, Hersov L, editors. Child and adolescent psychiatry. Oxford: Blackwell Science; 1994. p. 546-68. 21. Denckla MB. Language disorders. In: Downey JA, LowNL, editors. The child with disabling illness. Principles of rehabilitation. New York; Raven; 1982 .p. 175-202. 22. American Academy of Pediatrics. Guidelines for health supervision III. IL: Elk Grove Village; 1997. 23. Ireton H, Glascoe FP. Assessing children's development using parent's reports; the child development inventory. Clin Pediatr (Phila) 1995;34:248-55. 24. Bricker D, Squires J. Ages and stages questionnaires: A parent completed, child monitoring system. 2 nd ed. Paul H. Brookes Publishing Company; 1999 . 25. Capute AJ, Palmer FB, Shapiro BK, Wachtel RC, Schmidt S, RossA. A clinical linguistic and auditory milestone scale. Prediction of cognition in infancy. Dev Med Child Neurol 1986;28:762-71. 26. Frankenburg WK, Dobbs J, Archer P, Shapiro H, Bresnick B. The Denver II: A major revision and restandardisation of the Denver developmental screening test. Pediatrics 1992;89:91-7. 27. Fenson L, Pethick SJ, Renda C, Cox JL, Date PS, Reznick JS. Short form versions of the mcArthur communicative development inventories. Appl Psycholinguist 2000;21:95-6. 28. Coulter L, Gallagher C. Piloting new ways of working: Evaluation of the WILSTAAR programme. Int J Lang Commun Disord 2001;36(Suppl):270-5. 29. Fluharty NB. The design and standardization of a speech and language screening test for use with preschool children. J Speech Hear Disord 1973;39:75-88. 30. Coplan J, Gleason JR, Ryan R, Burke MG, Williams ML. 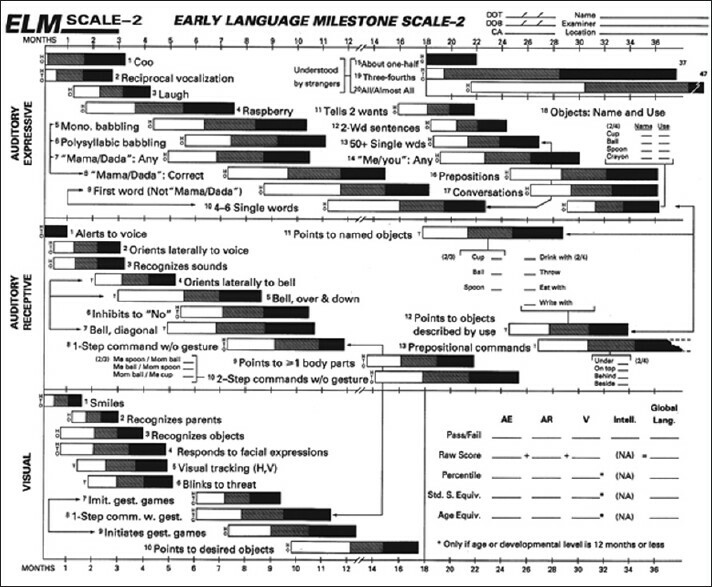 Validation of an early language milestone scale in a high -risk population. Pediatrics 1982;70:677-83. 31. 31 Dunn LM, Dunn LM. The Peabody picture vocabulary test Revised (PPVTR). Circle Pines, Minn: American Guidance Services; 1981. 32. Avery ME, First LR, editors. Pediatric medicine. Baltimore: Williams and Wilkins; 1989. p. 42-50. 33. Resnick TJ, Allen DA, Rapin I. Disorders of language development: Diagnosis and intervention. Pediatr Rev 1984;6:85-92. 34. Dr. Altman. Speech delayed Children. An FMRI study. Journal of Radiology. Radiological Society of North America. 2006;4:24-30 . 35. Alexander KC, Leung C, Pion K. Evaluation and management of the child with speech Delay. June 1999. The American Academy of family Physician s web Archive. http://www.aafp.org/afp. 36. Brookhouser PE, Hixson PK, Matkin ND. Early Childhood language delay. An otolaryngologist's perspective. Laryngoscope 1979;89:1898-913. 37. Law J, Garrett Z, Nye C. Speech and Language therapy interventions for children with primary speech and language delay or disorder. Cochrane Database syst Rev 2003:CD004110 . 38. American Academy of Pediatrics. Developmental surveillance and screening of infants and young children. Pediatrics 2001;108:192-6. 39. Centres for disease Control and prevention. Using Developmental Screening to improve child's health. Accessed online at http://www.cdc.gov/ncbddd/child/improve.htm. 40. American Speech-Language -Hearing Association. Preferred practice patterns for the profession of speech-language pathology. Accessed online at http;//www.nsslha.org. 41. Bashir AS, Scavuzzo A. Children with Language disorders; natural history and academic success. J Learn Disabil 1992;25:53-65. 42. Catts HW, Fey ME, Tomblin JB, Zhang X. Longitudinal investigation of reading 35outcomes in children with language impairment. J Speech Lang Hear Res 2002;45:1142-57. 43. Scarborough HS, Dobrich W. Development of children with early language delay. J Speech Hear Res 1990;33:70-83. 44. Richman N, Stevenson J, Graham PJ. Preschool to school: A Behavioral study. In: Schaffer R, editor. Behavioral development: A series of monographs. London, United Kingdom: Academic; 1982. p. 228. 45. Bishop D, Clarkson B. Written Language as a window into residual Language deficits: A studies of children with persistent and residual speech language impairments. Cortex 2003;39:215-37. 46. Stern LM, Connell TM, Lee M, Greenwood G. The Adelaide preschool language unit. Results of follow up. J Paediatr Child Health 1995;31:207-12. 47. Young AR, Beithchman JH, Johnson C, Douglas L, Atkinson L, Escobar M, et al. Young adult academic outcomes in a longitudinal sample of early identified language impaired and control children. J Child Psychol Psychiatry 2002;43:635-45. 48. Felsenfeld S, Broen PA, McGue M. A 28 year follow up of adults with a history of moderate phonological disorder. Educational and occupational Results. J Speech Hear Res 1994;37:1341-53. 49. Cohen NJ, Barwick MA, Horodezky N, Vallance DD. Language achievement and cognitive processing and behavioral characteristics of psychiatrically disturbed children with previously identified and unsuspected language impairments. J Child Psychol Psychiatry 1998;39:865-77. 50. Cohen NJ, Menna R, Vallance DD, Barwick MA. Language, social cognitive processing, and behavioral characteristics of psychiatrically disturbed children with previously identified and unsuspected language impairment. J Child Psychol Psychiatry1998;39:853-64. 51. Schutster MA. Developmental screening. In: Mcglynn EA, editor. Quality of care for children and adolescents: A review of selected clinical conditions and quality indicators. Santa Monica, CA: RAND; 2000. p. 157-68. Sidhu, M., Malhi, P., Jerath, J.